A few decades of trading has taught me that what many people know “for sure” can sometimes be way more off base than they ever imagine. I am not advocating MMT as a policy prescription by any means, but as some of my more pro-MMT readers remind me, MMT is more of a framework for economic thinking than an actual policy guideline. Instead of dismissing MMT as the playground for foolish young people who want to change the world for the better (the nerve of them! ), I have decided to learn everything I can about this novel way of thinking about economics. In doing so I have immersed myself in Warren Mosler’s writings and interviews. And I must admit, I have come to like the guy. Like, really like him. Firstly, for all you hard-money-right-wing-Russ-Roberts-type-disciples who throw up in your mouth whenever MMT is mentioned, Mosler is still a capitalist at heart. He’s an ex-hedge fund manager for Pete’s sake! This guy isn’t some ivory-tower-bearded professor who spouts crazy theories from the safety of his tenured professorial position. No, Warren has played the investing game for decades and been extraordinarily successful. Along the way he has also done some crazy entrepreneurial things – from creating a world-class supercar (Motor Trend video) to designing a new type of ferry whose passengers are less prone to sea-sickness (see this video). Back in 1985 Warren Mosler revealed the Consulier GTP and from the onset it broke many so-called industry rules. It may have been ugly, but it was ridiculously fast and extremely light, weighing just 1,900 lbs. It had over 1g of grip on the skidpad, returned 30 mpg and was quite safe due to its composite body. 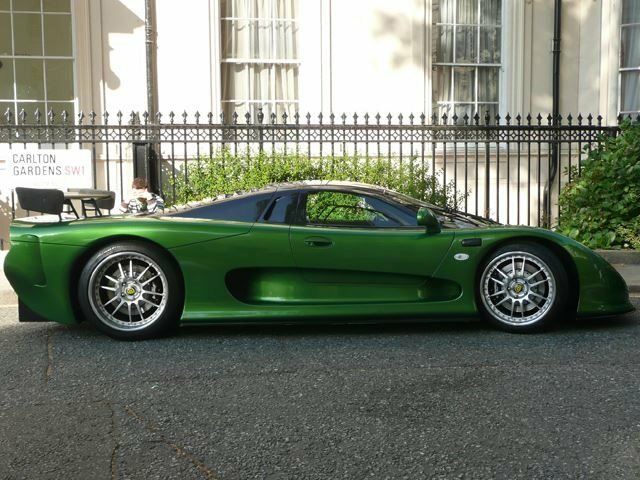 Unfortunately, hardly anyone took notice and it wasn’t until the 2001 reveal of the MT900 Photon did Mosler finally gain more recognition and respect for what his vision of a high-performance sports car should be. Warren Mosler is a truly unique thinker and you would be foolish to dismiss his theories as something we cannot learn from. Personally, if someone has made themselves a billionaire trading a particular theory that everyone else pooh-poohs, it only makes me all the more interested in his way of thinking – if you want to call me naive for being intrigued by his ideas, then I guess I am naive. Which brings me to present day. I promised a bull retort to my previous bearish post. The reason for the long preamble about MMT is my bullish argument is founded on some MMT-type thinking. But before I get into the meat of the argument – one caveat. Over the last month we have had one of the most intense rallies in a long, long time. The stock market is up on a stick, and we are due for a correction. The trader-in-me is loath to post this bullish argument as I think the next 100 S&P points are down, not up. Keeping that in mind, let’s get on to the bull case. The other day I listened to Warren Mosler’s interview on The Bob Murphy Show – “Episode 18: Warren Mosler Defends the Essential Insights of Modern Monetary Theory (MMT)” During the interview Mosler conceded that fiscal stimulus was best used in specific programs that had positive benefits regarding income inequality and other socially justified ends, but that fiscal stimulus was fiscal stimulus – whether that was government spending or tax cuts. What I find most interesting is the realization that what Mosler and fellow MMT’ers would recommend at this stage of business cycle would be more fiscal stimulus. You see, MMT’ers believe that in the absence of inflation (real constraints) there is no reason for the government not to continue spending. As long as there is slack in the economy somewhere, MMT’ers believe that government stimulation results in higher real GDP output. Though Mosler probably wouldn’t have counseled for Trump’s tax cuts, I am fairly certain the extended nature of the economic recovery wouldn’t have derailed his belief that fiscal stimulus would still be appropriate. After all, inflation is still below target and the amount of underemployed workers is still large. This is in contrast to Keynesians who would argue that during expansions governments should pay back that which they borrowed during economic slowdowns. Now, we all know that governments rarely balance budgets, but before Trump, the Republicans at least used to give lip-service to the idea. But the Trump tax cut was unprecedented at this stage of the business cycle. And I know Trump isn’t actually embracing MMT as a new sect of economic religion, but let’s face it – the idea that deficits don’t matter has him on the same page as the MMT’ers. Then let’s examine the next tenet of MMT – that which government spending doesn’t actually need to be borrowed, but instead can be financed through credit creation (once again, only up to the point where the economy becomes constrained in real terms – not financial terms). Well, what is Trump saying about quantitative tightening? Why, that it’s terrible of course and should be stopped immediately. So let’s think about this. If Trump is pushing for the Federal Reserve to not wind down their previous quantitative easing (balance sheet expansion) then isn’t he advocating for a permanent expansion of the balance sheet? And if so, isn’t this the same as the government spending while monetizing it? Again, it sure sounds an awful lot like MMT. When you combine this balance sheet pressure with Trump’s complaining about interest rate increases, it is clear that Trump wants fiscal expansion (through tax cuts) along with low interest rates and a permanently large Federal Reserve balance sheet. 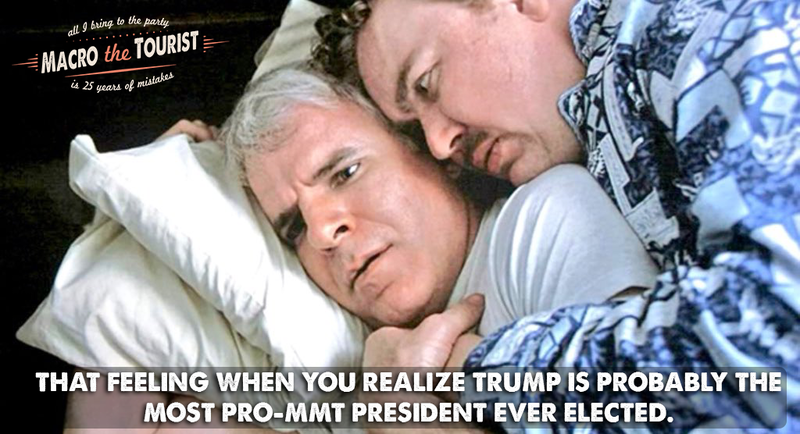 I am going to say something that will offend both sides of this debate, but Trump is the most MMT-like-President ever elected. Yup. I said it. The real question is what does it mean? 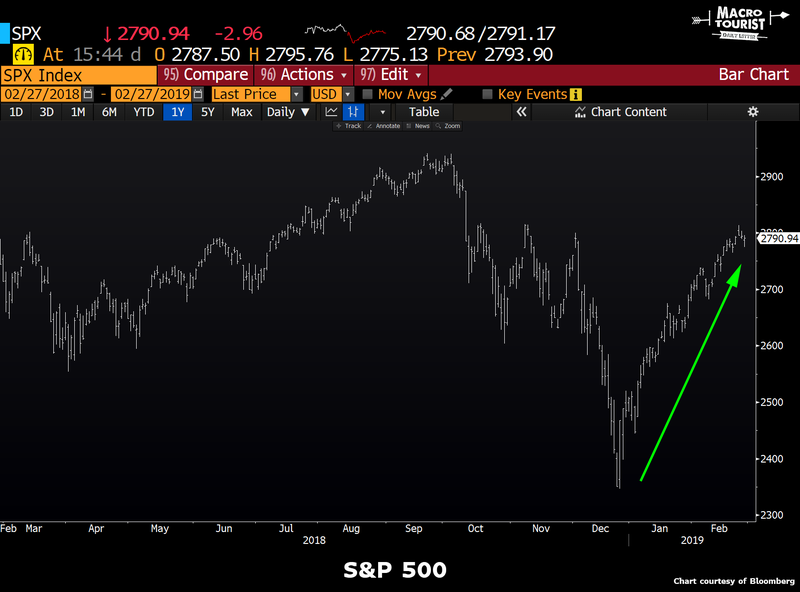 Well, I am going to include a chart from my good buddy Brent Johnson from Santiago Capital who will be horrified that I am including him in this piece that will surely irritate both the left and right, but nonetheless – here I go – it’s simply too good a chart. The Federal Reserve has effectively been neutered with Jay Powell’s recent flip-flopping because of Presidential and Wall Street pressure. So the Fed is now in line. 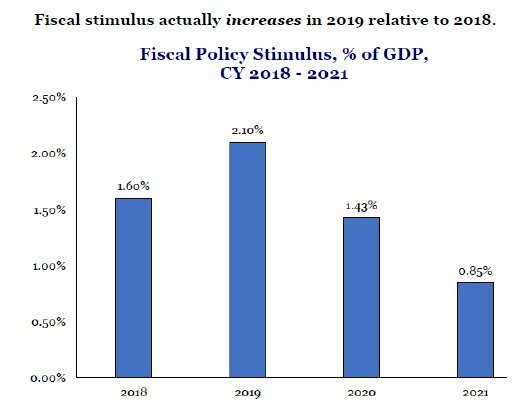 And as the chart shows, a lot of the fiscal stimulus is still ahead of us. A Central Bank that is facilitating aggressive fiscal stimulus irrespective of the stage of the business cycle sure sounds like an MMT’er’s dream. And although I still think the stock market is due to roll over, I am open to the possibility that this recipe is much more combustible to the upside than almost anyone can imagine. Just remember, things aren’t always as they seem. Sometimes you think those are two fluffy pillows when they are really something else.